That began to change, however, three years ago when her sister Mary’s first baby became suddenly very ill, and for a while, the outlook seemed very bleak for the little girl. Happily, little Erica pulled through and made a complete recovery, being now a typically happy toddler, completely unaware of the drama and heartache of her fortunately brief hospital stay – or the legacy it would inadvertently have. Her printer had run out of ink, so she simply popped to the store cupboard to get a new cartridge, as she had done countless times before, but this time, the little folded white plastic bag that fell out of the box struck an entirely different chord. 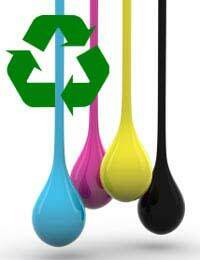 For there, beneath the photograph of the mother and baby smiling out from the bag were the words Let’s Recycle and Save Babies’ Lives – an appeal from the charity Tommy’s for old printer cartridges. This simple start was the beginning of what has grown into something of a one-woman-campaign, though she doesn’t feel entirely comfortable with the description herself. One of her friends, however, tells a slightly different story. She is, it seems, quite the gentle persuader; “pleasantly persistent” apparently, in her attempts to change minds and get as many people as she can stuffing Tommy’s bags with their unwanted ink containers. She even carries a few bags in her pocket – ever ready to pounce, though in the nicest possible way! Few who know her would argue with that.